This is a quick and easy sketch! I water colored the flower and leaves with SU! and PaperTrey inks and an aquabrush. All stamps and paper are from PaperTrey. Happy Friday! Here's this week's sketch, I'm going to ask that you try to keep things square. If it's not working out, that's okay, as long as you're inspired! Here's my take on the sketch! Very basic. My card measure 4.25x4.25 The main image panel is 2.5x2.25. The rest seems pretty straightforward. 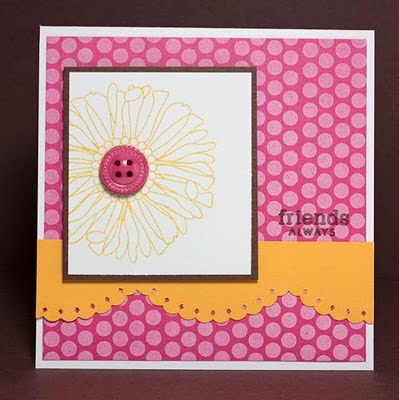 Supplies: Stamps: Friends 'Til the End, Polka Dot Basics II, Faux Ribbon Ink: Summer Sunrise, Fresh Snow, Chocolate Chip Paper: White, Dark Chocolate, Summer Sunrise, Raspberry Fizz Accessories, etc. : Scalloped border punch (EK Success), button Just a side note, I made a little video about what I'm calling the "Faux Letterpress Technique" over here. I call it faux, since I'm using a die-cut roller machine and not an authentic letterpress. I know people of the letterpress art probably cringe when anyone refers to it as letterpress. As always, feel free to leave a link! I used the colors form the Color Throw Down blog - CTD84. I think they worked well with this sketch! 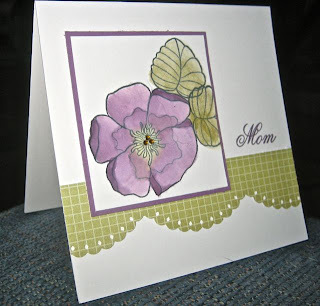 I also used a Cuttlebug embossing folder to add texture which was the Stamp Simply (ssnotime131) challenge for today. I just really wanted to share this card (technically I made it Tuesday, but I only uploaded it today). 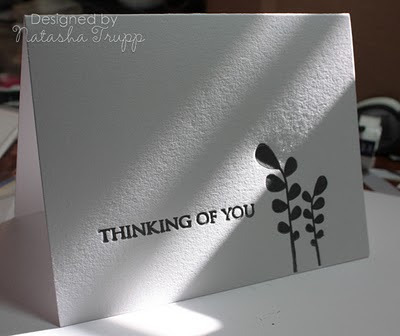 As I discussed over at my other blog I've gotten a little into letterpress, or at least attempting to make a faux version. 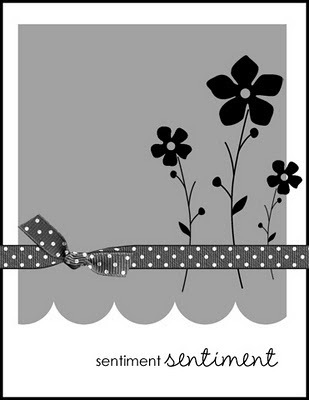 This card features two of my designs that I had made into photopolymer plates. I inked them up with some grey ink (from Lifestyle Letterpress) and ran them through my cuttlebug on some luscious Crane Lettra cotton paper. I love the results! I also liked how the sun was shining, so I photographed it without the photo box. I think it helped the texture of the pressed design and the paper appear a bit clearer. Another layout with lots of possibilities. I used an Inkadinkado butterfly image and blinged it up with Amuse Twinklers of various sizes. The sentiment is from PaperTrey. 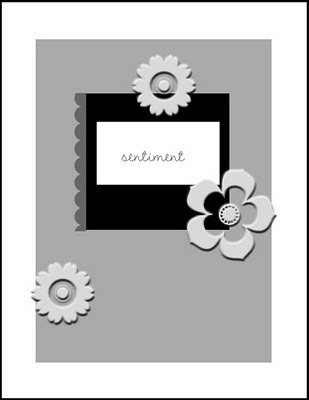 Create 3 1/4" x 6" kraft card base. Cut 2 3/4" x 5 1/2" piece of kraft CS and punch four 1" circles. 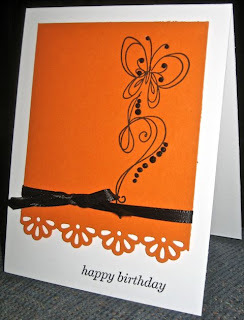 Adhere piece of patterned paper behind the kraft layer, then stamp sentiment in brown ink. 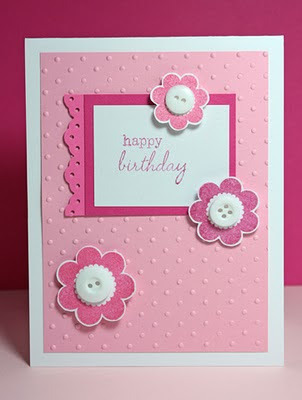 Attach layer to card base with pop dots. 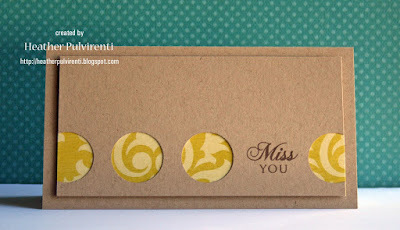 Paper - Kraft, Reminisce "Lovely"
Hello! Happy Friday afternoon! This week's sketch is a really basic clean and simple design. 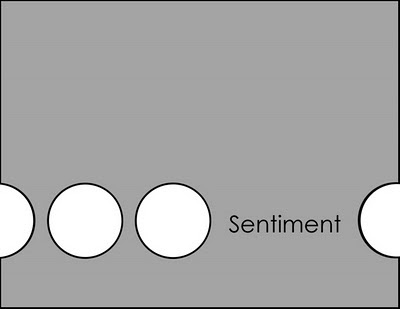 The key is to use circles. 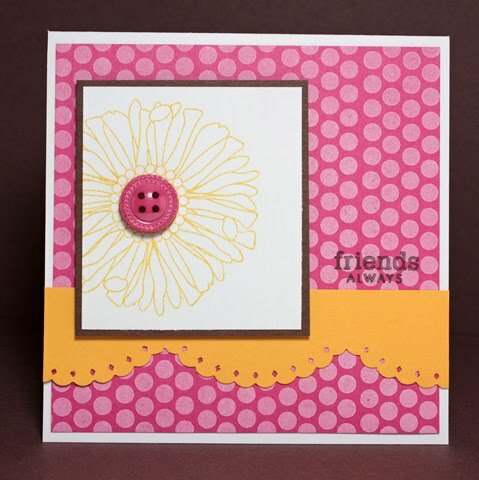 Feel free to make the circles with patterned paper, as I have, or to fill them with small images or embellishments. I used a 1-inch circle punch. Here's my take on the sketch. 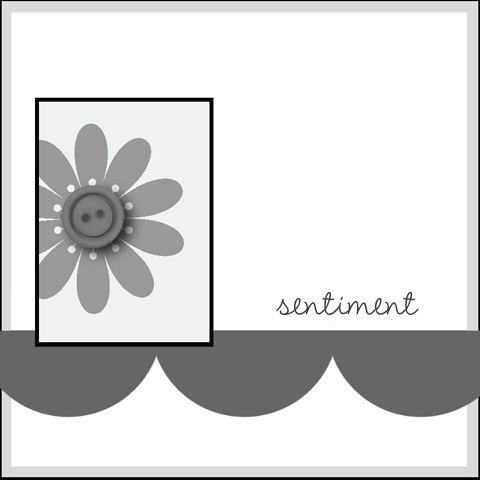 I used papers from the Sweet Pea pack. The sentiment is from a PTI stamp set. If you play along, feel free to leave a link below! 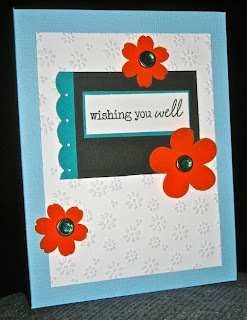 Create A2 card base using kraft CS. 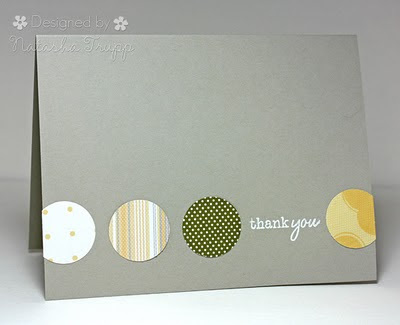 Cut 3" x 5 1/2" piece of patterned paper and adhere to card base, then use corner chomp to round upper right corner. Punch scallop edge from brown CS and adhere to card base. Stamp flower stem in brown ink onto cream CS, and round upper right corner. 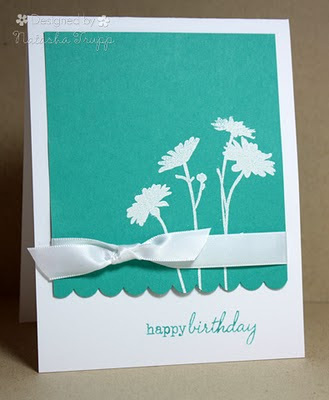 Stamp two flower images onto cream CS with aqua ink, cut out, and adhere to flower stem. 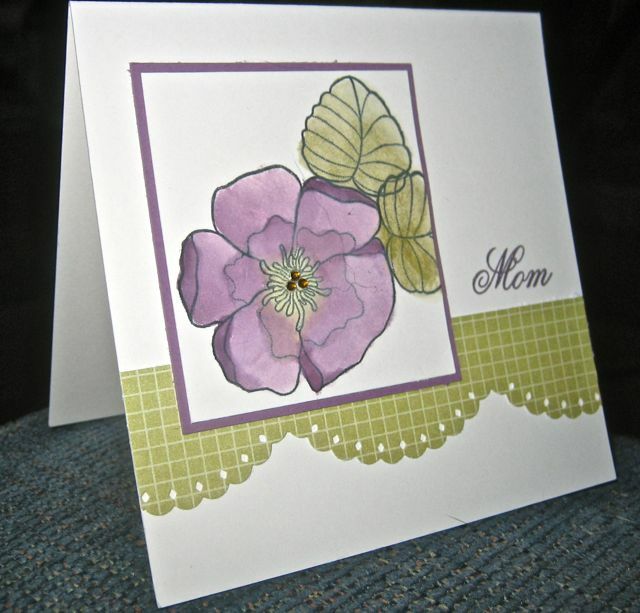 Attach image to card base with pop dots, stamp sentiment in brown ink, and embellish flower center with rhinestone. Paper - Kraft, Dark Chocolate, My Mind's Eye "Lush"